This recommended little beauty, the Mini Micro Scooter has been around for quite a few years and has stood the test of time well. 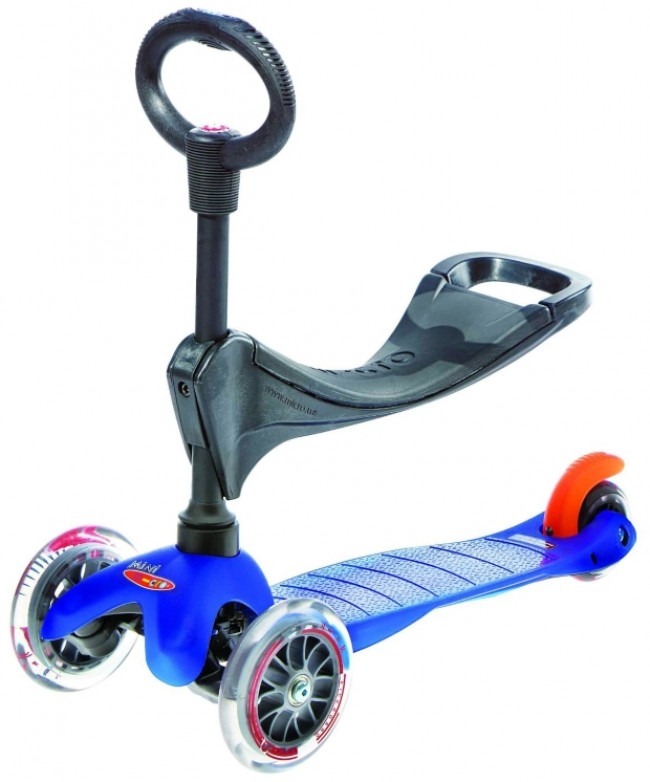 The first thing you will notice is that it has 2 wheels at the front which is the main reason that this kick scooter has been a best seller for so long. Apparently some Swiss medical experts were instrumental in the design but I am unsure in what capacity. The Mini micro is full featured with it's patented design and special fron wheel steering mechanism which is like a rack and pinion system similar to a car steering rack. This clever unit means that the steering is controlled by leaning the scooter which is perfect for toddlers to learn and gain confidence. Once they get up to speed it's even possible to lean and take wide corners really fast. There is a built in safety feature here as the turning circle is quite large. This means that short, tight circles while cornering are impossible to do- making it very, very difficult to fall off while going around a curve. The two front wheels of the Micro Mini Scooter help with the balance and the wheels are fairly big as well which again help with the balance and are better on uneven surfaces. The tires are made of Polyutherane or hard rubber as it sometimes known as, so that adds to the smooth ride and will be hard wearing on asphalt surfaces. The braking system is a nother clever innovation which I believe Micro Kickboard introduced into the market of toddler scooters. It's a rear wheel brake fender which is sprung. A child just needs to step on it and it slows down the back wheel. It's a very intuitive brake to use that most children will get the hang of quickly. The board itself is made of plastic with reinforced glass fibre and it does not look like it can hold much weight but it is quite flexible but there is a max weight of 44lbs or 20kgs and but that should be adequate for your average 3 to 5 year old. What quite a few kids initially struggle with is the fact that you can’t turn the handle bar like traditional scooters and you have to lean the handle bar in the direction you want to move in. This can be quite disconcerting for a kid who is not used to this but believe me they will get used to it. My little girl took 3 days to get her head around this but when she did you could not stop her, other parents tell me their kids have mastered it in a few hours so everyone is different. This Mini Micro is also available as a 3 in 1 model, which means it's got all the accessories already pre-loaded! There is the little seat and a little handle instead of the handlebars. The Micro Mini 3-in-1 is around $183.99 right now and is good for ages up to 5 years old. You can buy the Micro Mini 3-In-1 with free shipping. This 3-in-1 mode is perfect for 18 month old kids who can already sit aup and balance well. they can hang onto the handle and sit comfortably while being pulled along by their mum next to their buggy. I see a lot of this on the school run nowadays. It's easier to get the kids out of the house if they can have some fun on the way to acadmic success in the mornings! At first our daughter was trying it indoors and that made it a little difficult as the Micro Mini has quite a wide turning circle so it was a lot of stopping, picking it up facing it in the right direction and starting again. When we got her outside on a smooth sidewalk she quickly got the hang of it and after 2 days she was taking it through pot-holes with my sharp protests going ignored. One word of caution, when she went from asphalt to grass she went head over heels. This does seem to be a common type of accident with these Micro Scooters in general as it seems a little front heavy. But, as with all ride-on toys, you have to be responsible and supervise your children at all times. That brings me to the subject of Kids Protective Gear and Choosing the Best Toddlers Helmet which could literally safe their life one day by protecting against serious head injury. I should also mention that as with all kick-scooters it does not handle going over a stone very well and that will also result in a forward trip for your toddler. Ensure that they are properly protected with helmets, knee and elbow pads and only let them out on even surfaces until they are competent enough evaluate risks for themselves. The Micro Scooter comes in a couple of varieties, The Mini Micro for kids from 2-3 or 4 (which this review is about). 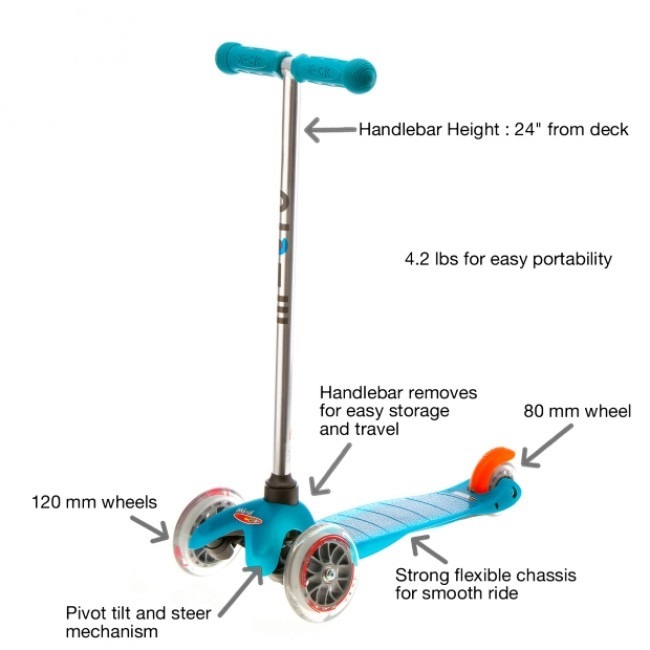 It's older sister product is the Micro Maxi scooter (which we will cover in a nother review soon) whichcan hold up 110lbs or 50kgs so suitable for older kids up to 12 years old. 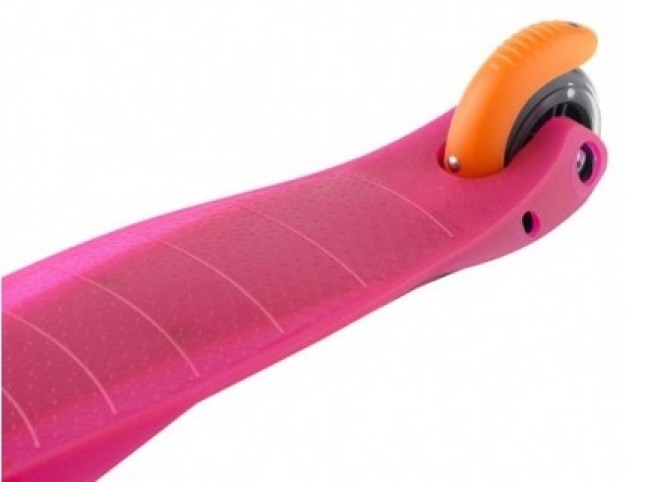 The Micro Maxi scooter has a longer kick board to accommodate bigger feet than the mini and I have seen a few models that have a pilot joy stick instead of handlebars for steering with which seems pretty cool! However, be asssured, we think that the Micro Mini Scooter is the very best on the market and comes highly recommended. A little expensive, yes but I promise that you will not regret it! The Micro Mini really is just about the best kick scooter for toddlers that you can buy. I wrote a review if anyone’s interested @ http://kickscooter.org/razor-a5-lux-scooter-review.